Organic ice cream made in front of your eyes. "Real" frozen yogurt. Gelato in mochi. Custard cream puffs. Japanese sweet crepes. All good things. But there comes a time when one wants something that hasn't been PR'd to death, hyped to overstatement, or so trendy that the dessert isn't just dessert, it's a fashion statement. Ice cream. Yes. Ice cream. Good. Honest. Simple. That's our thinking when we revisited Joe's Italian Ice last week, after months of pinballing around trying out the latest dessert fads. Joe's had what we needed. Ice cream cones. And syrupy ice slushie things called Italian ice. All in a place the press had long forgotten about. It had been a few years since we'd been back. And it was just as we remembered. It's a lonely hut, on a lot, parked along a dark stretch of road, just outside of the border from the pulsing brightness of Disneyland's neighborhood. Standing there in the night, Joe's luminous stand looked like something straight out of an Edward Hopper painting -- a refuge from the desolate, bathed in light. Ice cream flavors covered the usual menagerie, but included Spumoni and Toll House Cookie Dough. The latter was a rich ordeal. Too rich. I could only finish half my small scoop before my brain said, "That's enough butterfat, thank you very much!" The Chocolate Dipped Cone went down easier. But the soft serve used is real ice cream; not ice milk like the fast food chains sell for a buck. So it took a while for my palate to acclimate itself back to the velvety smoothness, the ultra dense, calorically-concentrated character of it all. And of course, it's piped as tall as torch. No space inside the cone was left empty. I got my fill of ice cream that night. But I won't neglect Joe's again. Especially when it comes time for me to go try out the new O.C. outpost of a certain L.A. yogurt phenom. Do I even need to mention its name? Oh, that looks really good. I always see this place when getting some Alberto's but I've never actually gone in because it always seemed to be a bit "ghetto." This place is often overlooked because of their location, but everybody should try it at least once. This is definitely an old school dessert place, but one that will stand the test of time. This was my next stop after a satisfying meal at the previous location of Los Sanchez across the street. The Bada Bing Cherry italian ice is a 'must' especially in combination with the soft serve vanilla ice cream. I have created devotees out of people I introduced to this place. I hope it retains its "best kept" secret status as I would hate to deal with a long waiting line when it becomes a hit or a "cool" place to get your sugar fix. Hey MM, did you get any pics of the cute girls, serving the ice cream? You know, the ones with the super flirty smiles. Haha.. yeah this is the spot to get no-nonsense ice cream. I always pass by this place when I'm around D-land but never had the urge to stop in. Maybe I should give this place a shot I do love soft serve ice cream especially the rich and creamy kind. I could really go for their chocolate milkshake right about now. Their chocolate dipped bananas, however, weren't that great. Do they still hand out punch cards, where if you buy x-amount you get something for free? It's so ghetto, it's actually in the ghetto. At least that's what the area of Harbor south of Chapman feels like. You said it. Old school. I can't ever see one of these newfangled dessert joints ever having Spumoni as a flavor. But Joe's can pull it off. And no one bats an eye. I have to go for that flavor next time for sure. Ahh! I'll have to try the ice/ice cream mix next. The night I went the place had a line "out the door". Which is a misnomer, because it has no door -- just a walk-up window. But in the line there were a good mix of out-of-town tourists and locals like us. There was one young chick serving the ice cream that night and she was flustered beyond belief. Couldn't believe they left her alone. I was going to take a picture, but figured she'd probably had enough nonsense for the night. HAHA! But yeah, she's still all smiles. I guess that's what happens when you work with ice cream. Yep. Got my Joe's card right here. With three holes punched out of it. I'm sure it won't be long before I get something free. Been a reader of your post for a while now, finally decided to post something. Joe's is great!!! Next time you go you should most definitely get the orange cream twist. This is my favorite item on the menu, the combination of the smooth soft serve and the tartness of the orange is amazing!! 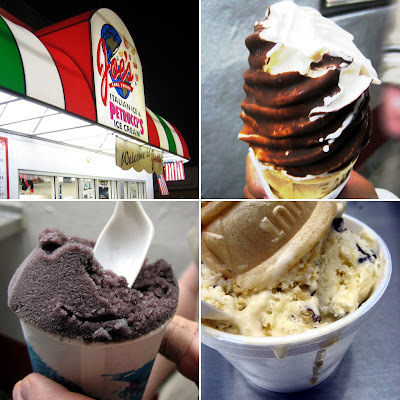 Another item that is a must try is the Joe Latti, which is a combination of any italian ice and their soft serve on the bottom and top of the italian ice. I agree with you about the scooped ice cream. I asked them where they get it from and they said it was either Breyers or Dreyers. Quite a disappointment. Their Italian ices are too sugary for my taste, but the ice cream is a quality product. I am sorry, Mr. Elmo, but you are completely wrong. You can never have too much butterfat. What's the texture like of the ices? So that's what a Joe Latti is. And the orange twist is a good way to temper the richness. Root beer ice cream in a root beer float. Yum! All their stuff is sweeter than Asian desserts aren't they? Why is that? Seems like it's the same for American desserts. Actually, the Italian Ices are like granita! No calamansi flavor though. Not yet. I went, I saw and I ate. I tried the orange twist (excellent), the bada-bing with ice cream (even better) and the straight watermelon ice (pretty good). Thanks for the tips. What can people tell me about the following restaurants on Harbor about a block down on the left side before Garden Grove Blvd: (1) El Moctezuma (Oaxacan food); (2) Thai Food (that's really its name); (3) La Casa Brito; (3)Mr. Pollo (Peruvian) and Flor something (El Salvadorean)? There restaurants are in a clean strip mall and all looked promising. yum! rarely wander over to garden grove when we are in the OC, but this definitely looks worth a try. my friends are in ayogurtland craze right now. 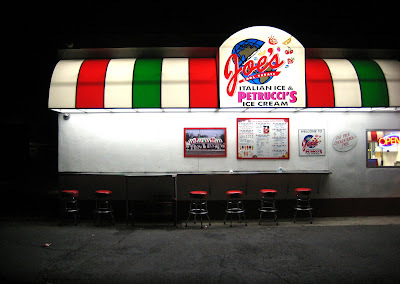 i just checked out joe's italian ice last night - this was delicious! the best soft serve vanilla dipped cone i have ever had. i'm addicted now!!! Not sure about those restos. They do indeed sound good though. If you try them before I do, please let me know what you think. I think I've been to Yogurtland one too many times. I'm now going into a full throttle obsession with Beard Papa's. I can see that stuff being very addictive...and dangerous! Careful my friend! Don't miss the fact that the ice flavors change all the time. They make their own from whatever looks good to them at the produce market that week. They may be colored beyond reason but the flavors are mostly natural. Joe's Italian ices are awesome! Best Italian ice I,ve had since pizza and cherry italian ice in the Bronx. Recommend to all.